I Love You More Than Carrots: Our First Baby Purchase! Okay, never in my entire life did I ever think for a minute that Hubs and I would sit down, spend an hour on Consumer Reports and once armed with what seemed like limitless knowledge, purchase our first "baby" item. With little to no argument. For those of you whose interest I've peaked, it wasn't even a crib. Hubs and I are very lucky in so much that the company for which Hubs works supports healthy lifestyles. Each year Hubs is given a "fitness allowance" which basically pays a certain percentage of a specific piece of fitness equipment. In the years that he's worked for this company, Hubs has purchased some pretty sweet equipment. A great road bike, for instance, followed by ginormous and quite manly adjustable hand weights. Eventually, it was in the works that we'd eventually splurge on a nice road bike for moi, so that I could accompany Hubs on his bikerides across town. That is, until we learned that this year, the "fitness allowance" has been stretched to cover jogging strollers. Say what!? As soon as Hubs nonchalantly mentioned this from his comfy spot at the kitchen table, I dropped my can of pledge and practically ran out of the room to sit with him. I don't jog. I've never jogged. In fact, I have what's known as "exercise induced asthma." Basically the only way I can run, even short distances, is with one of those nifty little handheld inhalers. Awesome. I long for the days back in high school when I could run a five minute mile with the greatest of ease- but those days are long gone. I can barely walk more than a few miles before I'm a wheezing mess. Despite my lack of jogging, I knew we needed a jogging stroller. I've heard such fab things about these strollers (mostly from blog-stalking) and from a few of the Mom's at work- and I truly have all intensive plans to start walking immediately post-baby. Granted, apparently you're not supposed to put baby in one of these until they are atleast 6mo. old, so clearly we've got some time. However, Hubs' fitness allowance must be taken full advantage of by the end of March. Hand brakes versus no hand brakes. Locking front swivel-wheel versus non-locking front swivel wheel. 12" AW wheels versus whatever the other black wheels were. Red, Black, Orange? Do we need the Ironman model? (Er, Hubs, I don't jog. Let alone train for marathons. I'm pretty sure we don't need the Ironman model). 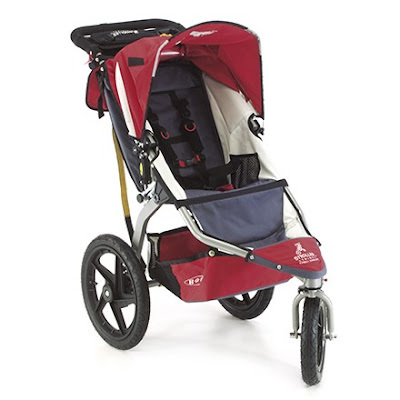 The BOB Fitness Strides stroller. I think I love it. Actually, I'm pretty sure I love it. And I can't wait to register for all of the shiny coordinating attachments that go with it. Like, for instance, the Car Seat Adapter. Or the Weather Shield. Or the Handlebar Console. And we'll obviously need the Warm Fuzzy. I. Am. So. Excited. So exciting! We have a similar jogging stroller and love it! It's nice when Skip would take Meredith out in a run in it and I could have some quiet time to do another workout, or just sleep! Very cool!! Yay for the first purchase...much much more baby fun stuff to come!! That's awesome! I need to see if my company or my husband's has the same sort of deal. I want one! Exciting. That is cool that your hubby's work covers a fitness purchase, I wish more companies did that! That was our first purchase too! My sister said not to get a travel system. She LOVES her BOB. We are always on walks or bike rides so I figured it was going to be necessary. The infant car seat adapter is exactly the way to go to avoid the travel system stroller. One less thing needed, right? BTW, get on the BOB website and check which car seats work with the adapter. There are only a select few. We went with the Britax Chaperone. Good luck with future purchases! they are totally good for more then just jogging! those big-wheeled strollers get around everything! My husband likes to fish...and so, my friend always took her baby in the jogging stroller through all this terrain to get to the lake..it was awesome! So i have one on my registry! lucky you getting one so early!! I can't believe your hubs' job covers this as a fitness expense!! I am totally jealous! I'm still trying to talk someone into buying us one of these!! Isn't it so much fun making that first baby purchase?!? Now you won't be able to stop! How fun! And how awesome that you essentially get that free!!! Oooh super jealous of the health & fitness expense!! Thanks for doing all the research for the rest of us! I emailed my self the name of that stroller for future reference! I LOVE that stroller. When are you due? How exciting! You are about to enter the best phase of your life!!! I am actually doing some great baby/mom giveaways over at my blog check them out! BIG day for the "M's" Tomorrow!! My Internet Tell-All? Sounds Scandalous. Sunday Bump Day; 16 Weeks, 1 Day. Want To Win Something Really Cool? Have You Seen My Sheepie? Hump Day.. Er, Rather Bump Day?